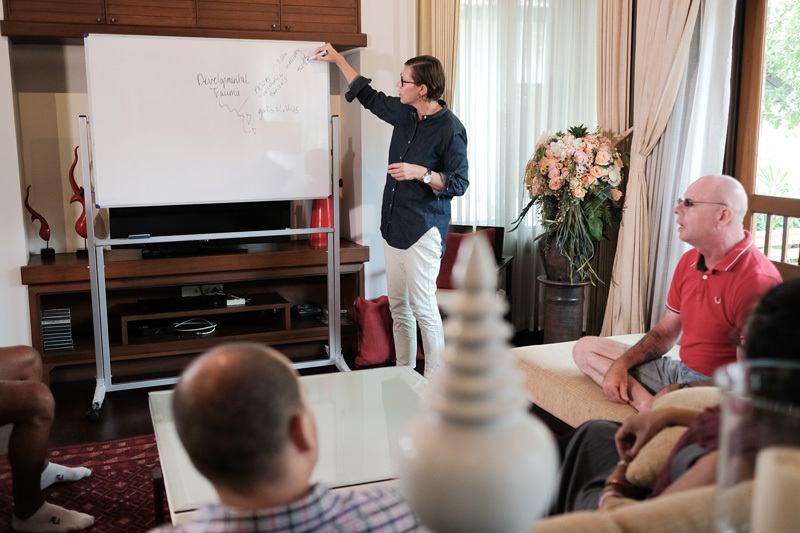 Situated in the beautiful northern city of Chiang Mai, The Dawn Drug Rehab in Thailand provides concierge-quality addiction recovery treatment for men and women struggling with substance abuse. Our option for drug addiction treatment is a multifaceted, customisable programme that focuses on holistically healing our clients physically, mentally and spiritually through a variety of evidence-based and experiential therapies. The Dawn’s team of expert providers help each client personalise their treatment plan to cater to each individual’s unique requirements; together, we learn your strengths and find the proper treatment, guidance and care for your needs. Our effective inpatient addiction programme is bolstered by a stunning, state-of-the-art facility that boasts immaculate grounds and buildings. We aim to ensure that every one of our clients receives maximum assistance and support, which is why we have a capacity for thirty individuals at a time with a 1:1 staff-to-client ratio. Additionally, our staff are also recovering addicts who have successfully found recovery and found fulfilment in providing treatment for those who are earlier in their journey to sobriety. The compassion and empathy they provide make them uniquely suited to work closely with clients who travel to our centre for treatment. We also pride ourselves on offering dual diagnosis treatment for clients who struggle with a substance abuse disorder as well as mental health concerns. Inpatient addiction treatment may also be called residential or full-time treatment. Clients who participate in inpatient recovery live full-time on-site during the initial phase of their recovery, sharing a living space with others in recovery while participating in daily, structured therapeutic activities. Residential recovery centres typically provide access to a range of amenities and full-time staff. This option is prevalent and widely recommended for those in the early stages of recovery because it allows for the most intensive treatment, guiding recovering addicts through the first days and weeks when they are most vulnerable to relapse. Inpatient drug rehab typically consists of two phases: detoxification and addiction recovery treatment. Detoxification, often shortened to detox, is a medically-monitored stage of treatment during which patients cleanse their body of a mind-altering substance. After substance abuse, especially prolonged abuse, the body becomes accustomed to functioning with a drug in its systems. It can be challenging to adjust to its absence — along with cravings, most patients in detox experience withdrawal symptoms, which can be uncomfortable and painful. Medically-monitored detox ensures that you are safe and at ease during this period. At The Dawn, our on-site detox facility makes the transition from detox to recovery simple and seamless. And, we strive to make all aspects of your treatment with us as pleasant as possible, even through withdrawal. We want your experience with recovery to be positive so that you can feel confident you are making the best choice for your health and your life. Addiction recovery treatment comprises the bulk of your experience in a rehabilitation centre. You may spend several weeks participating in therapies and activities designed to help your body recover, encourage you to mentally process your addiction and strengthen your sense of spirituality. Together, these healing processes provide important tools for long-term recovery, including healthy habits, behavioural awareness and a strong sense of purpose. Common therapies may include group or individual talk therapy, behavioural therapies, mindfulness exercises and experiential therapies like adventure or nature therapy. Many recovery centres also offer services like nutritional counselling and career counselling during this time to help you feel prepared to return to your life after treatment. During residential drug rehabilitation, you will be living full-time in a centre that is dedicated to your recovery. Your daily schedule will be filled with productive activities, meetings with your therapists or support groups and informational sessions designed to help you learn certain skills. The primary intention of this recovery model is to keep you busy with constructive activities and away from mind-altering substances at a time when most recovering addicts are especially susceptible to cravings or relapse. Why choose The Dawn Drug Rehab in Thailand? The drug rehab programme at The Dawn offers unparalleled options and services in a one-of-a-kind location. Our centre, staff and treatments have been carefully selected, curated and maintained to create a recovery experience unlike anywhere else. Our beautiful facility in Thailand harnesses the area’s natural beauty and incorporates it into our clients’ day-to-day experiences. The tranquillity of being away from the pressures of society provides a relaxing atmosphere where our clients can focus completely on their healing, free from distractions and stressors. Our licensed team of addiction professionals has extensive experience in treating addiction. They work closely with each client on an individual basis to help them create a highly personalised and intensive treatment plan — each client’s therapies and schedules are tailor-made to cater to their exact needs. We also have a detoxification centre onsite to provide our clients with 24-hour medical support as they make the transition from addiction to sobriety. One of the things that we believe sets The Dawn apart from many other treatment centres is our ability to look at each individual and determine their strengths and capabilities, instead of only focusing on their addiction. Once the elements in our treatment programme are mastered, our clients have a diminished need to return to destructive behaviours such as alcohol and drug abuse and can focus on leading a healthier, happier life. We show our clients that a substance-free life can be fulfilling and exciting by fostering healthy hobbies and interests that fit each client’s personality and lifestyle. We provide a mixture of Eastern and Western methods to ensure that our clients get all the tools that they need to lead a happy, fulfilling life. Our providers and our location allow us to deeply explore and experience both avenues of treatment to create a blend that is the best of both worlds, giving our clients a well-rounded and complete treatment programme. Our treatment centre includes a licensed on-site medical facility providing 24-hour medical supervision and support for drug detoxification. It is our goal to keep you as comfortable as possible during the difficult detox phase — we want to start your recovery off on a positive note and help you feel stronger and healthier as you begin recovery. Our individualised approach to treatment is targeted, precise and effective. We help each client identify their unique triggers and determine which coping mechanisms work best for them to prevent relapse. We work one-on-one with you to discover your interests and strengths, which allows us to develop a treatment plan that you can sustain on your own when you return to independent life. Which drugs are treated at The Dawn? If your addiction is not included in the list, please do not hesitate to contact us to discuss your treatment options. Our facilities are equipped to treat a wide range of concerns and we may be able to help with addictions to lesser-known substances. You may also be interested in learning more about our inpatient addiction treatment programme or our mental health recovery retreats for depression, anxiety, insomnia, burnout or mood disorders. We are also equipped to treat clients who struggle with one or more of these concerns, whether you are fighting an addiction to more than one substance or you have a co-occurring substance use disorder and mental health concern. Our treatment plans are flexible and fully customizable so we can blend our services to best meet your needs. The Dawn takes on a humanistic approach to therapy by assisting individuals as they acquire a healthier, stronger sense of self and become able to understand and recognise their feelings and develop a better sense of meaning in their life. Our addiction treatment programmes for drugs and alcohol use our unique Two Pillars approach to provide this holistic healing. We believe in treating the whole person — mind, body and spirit — to ensure that our clients feel completely renewed and ready to face substance-free, independent life with confidence and strength. When you enter our drug addiction recovery programme, you gain access to world-class staff and services that have been hand-selected to provide full recovery from drug abuse. It is our goal to ensure that our clients gain the confidence they need to live without relapse, and our Two Pillars are carefully designed to promote sustainable recovery. For our first pillar, we focus on rehabilitation by giving our clients the necessary tools to stop the negative behaviour and reclaim self-sufficiency. The two key elements of our rehab programme include the use of the widely recognised and time-tested 12-Step approach and the implementation of cutting-edge, clinically-proven Mindfulness-Based Cognitive Therapy (MBCT). The 12-Step approach is a group therapy model that offers a platform for peer discussion and social support. It is one of the oldest organised and studied approaches to addiction treatment, with origins in the 1930s. It is incredibly effective in helping clients create support systems, learn to trust others with their stories and leave behind the feelings of isolation that often comes with addiction. The 12-Step approach also provides clients with concrete, manageable goals that instil a sense of accomplishment and purpose. Alternatively, MBCT focuses on identifying negative behaviours and providing clients with the tools they need to change them. Through dedicated sessions of guided introspection and mental exercises, MBCT helps individuals to recognise their negative emotions and thought patterns, process them in a non-judgmental manner and learn new coping mechanisms to replace old, self-destructive ones. It also helps recovering addicts recognise the essence of being and the importance of staying in the present moment, releasing them from the confining context of their addiction and allowing them to move forward with their life. At The Dawn, these services are all offered by professional on-site providers in a comfortable and relaxing setting. We believe that wellness comes from within — when you are free from stressors, feel confident in yourself and can fully engage in healthy activities, you can find healing and recovery most completely. To help you achieve this, we focus on creating an atmosphere where our clients regain physical health and learn to care for themselves without feeling pressure or being tempted by harmful behaviours. The Dawn drug rehabilitation in Thailand is located on beautiful and private riverside land near the northern city of Chiang Mai. We offer top-tier amenities from on-site medical detox facilities to full-service staff, ensuring a complete recovery experience unlike anywhere else. We treat a variety of concerns including addiction to drugs and alcohol, process addictions and mental health disorders with a focus on compassion, holistic healing and long-lasting recovery. Our high-level services are available at affordable prices. If you or your loved one is in need of rehabilitation from drug abuse, please contact us today to find out if our programme is the right fit for you.